The ISM is pleased to announce the appointment of Jon Laukvik as visiting professor of organ at the Yale Institute of Sacred Music and Yale School of Music in the 2019–2020 academic year. Prof. Laukvik will take up the teaching duties for one year of Prof. Thomas Murray, who is due to retire at the end of June 2019 after thirty-eight years of distinguished and unrivaled service to Yale. Laukvik was born in Oslo, Norway, where he received his early training in piano, organ, and church music. Later at the Cologne Musikhochschule he studied organ with Michael Schneider and harpsichord with Hugo Ruf, and in Paris he was a private organ student of Marie-Claire Alain. In 1977 he was awarded the first prize and the Bach Prize in the organ competition at the Nuremberg International Organ Week. That same year he was a prize winner of the International Organ Competition in conjunction with the German Evangelical Kirchentag in Berlin. In 1980, he was appointed professor of organ and harpsichord at the University of Music and Performing Arts in Stuttgart, where he remained until his retirement in 2016. During this period, he held visiting professorships at the Norwegian Academy of Music (Norges musikkhøgskole) in Oslo (2001–2007), and at the Royal Academy of Music in London (2003–2017). 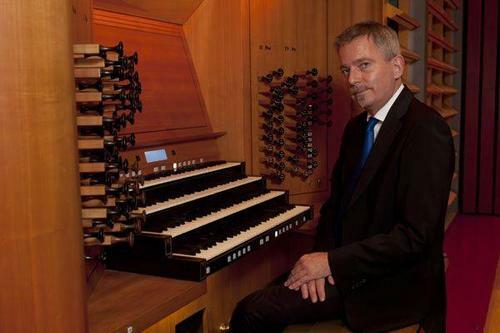 He has also served as a juror for virtually every major international organ competition in the world, including Alkmaar, Brno, Chartres, Dallas, Dublin, Groningen, Kaliningrad, Munich (ARD), Nuremberg (ION), Montreal, Odense, Prague (Prague Spring), and St Albans. He has taught courses and seminars throughout Europe and also in Asia. As a scholar, Laukvik has contributed two volumes to the series Historical Performance Practice in Organ Playing, published by Carus-Verlag, Stuttgart. They have quickly become standard texts in music education in Europe and the United States; both are available in English. Volume I covers the interpretation of works from the sixteenth to eighteenth centuries, the Baroque and Classical period. Volume II covers the organ and organ interpretation of the Romantic repertoire. He is the editor of a third volume in this series, Die Moderne, which includes articles by several authors like Guy Bovet, Anders Ekenberg, Hans-Ola Ericsson, Hans Fagius, Bernhard Haas, Jeremy Filsell, and Armin Schoof. An English translation of this volume is in preparation. He has also edited Handel’s Op. 7 organ concerti for Carus-Verlag (together with Werner Jacob). A complete edition of the organ works of Louis Vierne in thirteen volumes (edited together with David Sanger) was published by Carus-Verlag in March 2008. Active as a composer, he has written works for solo organ, organ with other instruments (i.e. piano, percussion, trumpet, trombone, cello, horn) as well as vocal and instrumental works. His recent compositions are published by Edition Svitzer, Copenhagen. Jon Laukvik is no stranger to Yale—he spent a week here as artist-in-residence in 2007, culminating in a magisterial recital in Woolsey Hall. The ISM and Yale School of Music are delighted to welcome this distinguished artist, scholar, and teacher to Yale next year.